Your boss is piling on more work than you can handle, pressuring you to meet deadlines for projects that you were not trained to do. You weren’t provided with the right tools, resources or support, but they still expect you to give top quality performance. This is a recipe for disaster! 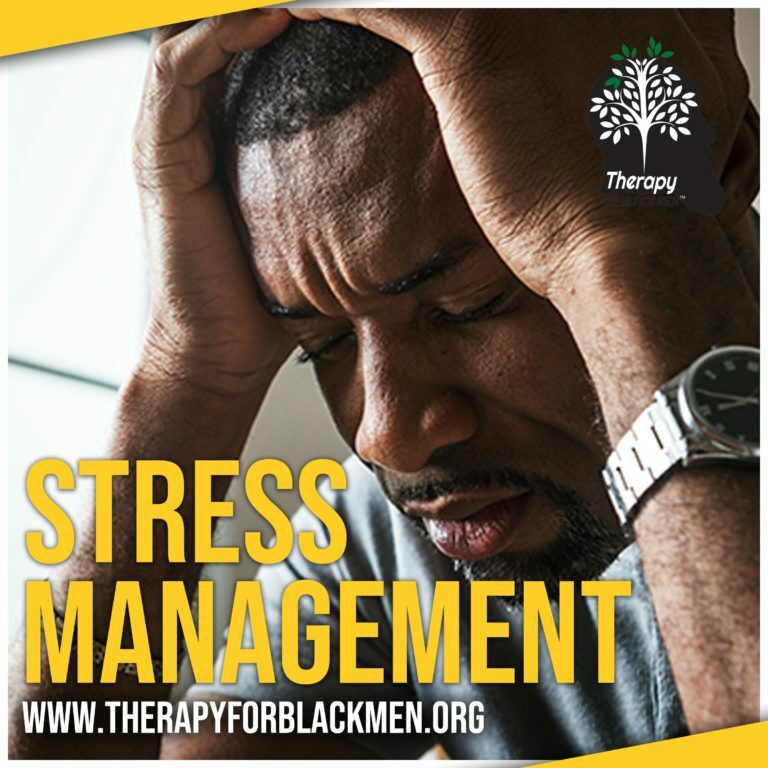 Unfortunately, there are also times when discrimination and microaggressions may also become a part of your work stress as a black man. Black men have to achieve black excellence and perfection at all times. During a commencement speech given in 2015, First Lady Michelle Obama told Tuskegee University graduates, “The road ahead is not going to be easy.” She was referring to working twice as hard to achieve the same opportunities as other races. Sometimes stress will grab you around the neck and choke you until you have no air, it sits heavy on your chest feeling like a ton of bricks … it weighs down your shoulders like heavy boulders… wreaking havoc on your spirit. Stress kills they say… it’s a slow-creeping silent killer. It kills your mood, your hopes, dreams and insidiously ravages your mind and body. Some common physical disorders exacerbated by stress are chronic headaches, high blood pressure, ulcers, arthritis, skin disease, neck and lower back pain. Sometimes you’ll feel like there are only two options — implode or explode on everyone at work. Both are unhealthy, both are self-destructive, but implosion could send you to the emergency room. When stress is left unmanaged, it may lead to anxiety, depression or substance abuse. There are two very common problems as a result of workplace stress — burnout and workaholism. Depersonalization — feeling resentful, apathetic, indifferent towards others; and Reduced sense of personal accomplishment — feeling as if your work and contributions don’t matter. Workaholism can be a positive or negative. Workaholism is positive if you really enjoy your job and love the work that you do. It becomes problematic when you are excessively working as a way of managing your anxiety and job insecurity. If you work someplace with high turnover, inadequate leadership and discrimination, you may feel like you are at risk to lose your job. In an effort to create job security, you may try to overcompensate by working all the time. If this is you, it’s time to get support. The two types of work overload are Quantitative, when there is too much work for a given period of time, or Qualitative, when the work is too difficult to effectively complete. Another stressor is work underload, when you are not challenged by your duties, but you may feel pressure to appear “busy” or productive for performance evaluations. Your personality is a factor into how workplace stress is experienced and managed. The Type A personality is more rigid, their inability to be flexible when they cannot meet the demands, or perceived demands, creates more psychological and physical effects than the Type B personality. The Type B personality is just as ambitious and works as hard as the Type A, but when exposed to the same stressors, shows fewer effects of the stress because of their flexibility. Type B has the ability to process information in a way that allows them to cope in high pressure situations. So being a Type B personality is not laid back, as people assume, they just have better coping mechanisms. Self-efficacy has been researched as a major factor in an employee managing stress in a healthy way. Self-Efficacy is the belief that you have the ability to accomplish something. People with high self-efficacy don’t get as stressed as those with low self-efficacy because they feel competent and capable of managing whatever comes up. Create boundaries, systems and routines for success. Take breaks throughout the day. Joining a support group, some companies have an Employee Wellness Program or Diversity & Inclusion Program, where you can get support in a safe, non-judgmental environment. Or join a professional organization for black professionals. Any physical activity will help to improve your mood. You can practice learning muscle relaxation techniques, breathing techniques and meditation techniques. Some companies have an EAP (Employee Assistance Program), to provide counseling through your company. You can also seek your own therapist, professional coach, mentor or career counselor. Anger is the only publicly acceptable expression of emotion that many black men have known growing up. The problem with the angry black man is he is seen as a threat, which comes with a host of consequences. The best thing you can do is focus on prevention. You can prevent some mental health disorders or manage them by practicing regular self-care — taking care of your mind and body, staying healthy and seeking supports sooner rather than later. It’s easier to prevent a breakdown than to rebuild after a breakdown. Seneca Williams is a former host of The Career Therapy Show with Seneca Williams, she is “The Career Therapist” empowering professionals in service-based businesses. She takes you from “emotional mess to career success”. Licensed therapist in New York and Florida and a certified professional coach. Seneca is the creator of Conquer Your Calling A 6-Week Program. Clients gain strategies, courage, clarity and consistent growth in their brand-new business!